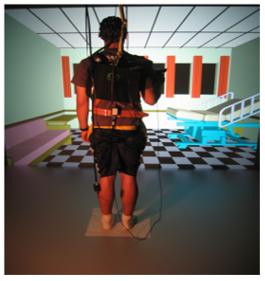 The TBI lab currently employs a number of protocols in our Virtual Reality testing system. We use HeadRehab, LLC, the NEUROSCAN system, EGI, and EEG as a basis to create our testing modules, and record the various kinesthetic responses of our clients using InterSense Inertial Motion Tracking System. The data we collect using our VR protocols assists us in providing comprehensive reports to the primary care physicians overseeing the care of Penn State athletes. (fMRI) Maps the changes in blood oxygenation present in the brain over time. Oxygenation levels change rapidly following activity of neurons in a brain region. 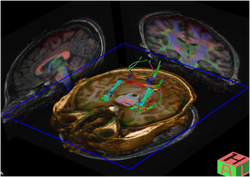 fMRI allows researchers to localize brain activity on a second-by-second basis. The TBI research lab uses fMRI to study the changes seen in patients prior to and following a TBI or successive incidents of TBI. (DTI) is a technique that enables the measurement of the restricted diffusion of water in tissue in order to produce neural tract images and provides useful structural information. DTI allows our lab to visualize the movement of fluid associated with metabolic processes DTI is used to compare control and mTBI populations, as well as view functional changes and abnormalities with TBI. Manenti; Carlani, M; et.al. (2007). “Diffusion tensor magnetic resonance imaging of prostate cancer”. Investigative radiology. 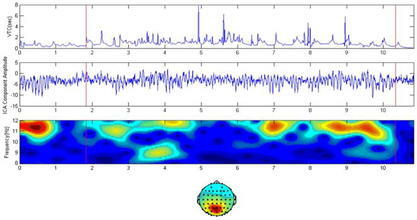 (EEG) is the recording of electrical activity along the scalp. EEG measures voltage fluctuations resulting from ionic current flows within the neurons of the brain. The EEG allows the TBI lab to see the electrical activity in a normally functioning brain, and then compare it to the electrical activity present following a TBI. Niedermeyer E. and da Silva F.L. (2004). Electroencephalography: Basic Principles, Clinical Applications, and Related Fields . Lippincot Williams & Wilkins. (MRS) helps characterize tissue using magnetic resonance in order to determine the concentration of metabolites in the tissue. This is extremely important to the ongoing research in our lab, as several studies have shown that the brain has varying concentrations of metabolites following injury, which may play a role in brain function post-injury and may increase the time of recovery. Neuropsychological testing is central to the concussion evaluation process. Neuropsychological testing involves the administration of tests that measure different cognitive functions. Cognitive functions that are routinely measured by these tests in concussion evaluations involve memory, attention, and information processing speed. The reason clinical neuropsychologists like Dr. Arnett administer tests that measure these cognitive functions when evaluating concussions is that research studies show that memory, attention, and information processing speed are the cognitive functions most likely to be affected by concussion. An additional important part of this type of evaluation is the assessment of concussion symptoms reported by athletes (such as dizziness, nausea, concentration and memory difficulties, etc.). When athletes show significant declines in their performance from baseline, this indicates that their brains are very likely still showing the effects of their concussion. Athletes who are not back to baseline are then tested at subsequent intervals determined clinically appropriate by the medical staff at Penn State in consultation with the neuropsychologist. Our lab provides clinical services in the form of assessment reports for primary care physicians overseeing the health and recovery of patients with mTBI. The comprehensive reporting modules for our virtual reality testing are used to give numeric values to the performance of the individual completing the test. 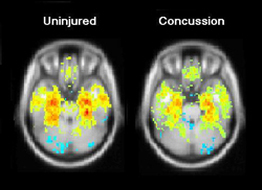 These carefully computed scores can be used to compare baseline results with the concussed scores. Our comprehensive scoring chart is a condensed version of the scores from each individual testing module. Individual reports of each test are also computed which give more specific information on each individual trial. These scoring charts display all results in a quick and easy manner in order for medical professionals to access their patient’s information.